High accuracy of radiometric calibration is a prerequisite and guarantee for quantitative remote sensing. The traditional calibration method based on radiation source could not meet the requirement for further application of remote sensing. Cryogenic radiometer is internationally recognized as a primary standard of light radiation with the highest accuracy, thus the radiation standard transfer chain which could be traced to cryogenic radiometer laid the foundation for quantitative remote sensing. It has been demonstrated that the reflectance and the scattering effect of Brewster window plays a significant role in characterizing the absolute power of laser. As to the successive calibration in wide spectrum, the wavelength of the output beam from the tunable laser varies as the polarization state changes, thus it is essential to accurately measure the polarization state and carry out repeated adjusting in different wavelengths. However, the workload of this traditional experimental scheme is too large, and meanwhile the uncertainty increases due to the low repeatability of the optical path. Researchers led by Prof. Xiaobin Zheng, from Anhui Institute of Optics and Fine Mechanics, Chinese Academy of Sciences designed and made use of a novel calibration optical path with the standard transfer detector which was placed inside the vacuum unit. This scheme theoretically eliminated the uncertainty caused by the window transmittance. It is reported in Chinese Optics Letters Vol.13, No.5, 2015. In this study, a fine instrument with automatic reset technology was used to increase the accuracy of the cryogenic radiometer and standard transfer detector switching into the optical path, therefore, the uncertainty caused by spatial non-uniformity decreased. Two calibration optical paths, covering visible and infrared spectrum respectively, have been established, in which beam shaping, spatial filtering power stabling, and stray light suppression technology were put into use. The novel optical scheme based on cryogenic radiometer for successive calibration in broad spectrum was introduced, which could efficiently reduce the window transmittance of cryogenic radiometer and therefore be used as a new calibration technique in this spectrum. At the meantime, the feasibility of cryogenic radiometer was improved. With the uncertainty being better than 10-4, this research result becomes a powerful support for the quantitative traceability of radiation standard. Dr. Weiwei Pang, the first author of this article, believes that the improvement of the accuracy of the radiation standard and the standard transfer system, reduction of the standard transfer chain and the final enhancement of application level of radiation calibration for remote sensor would be urgent subjects worldwide. As a matter of fact, the successive calibration experiments in ultraviolet-intermediate infrared band has not been carried out, especially those in infrared spectrum. In the next step, the research team would focus on the calibration process in the above band. Currently, a tunable laser has been equipped in their lab which covers the wavelength 350 nm~4.7 μm. 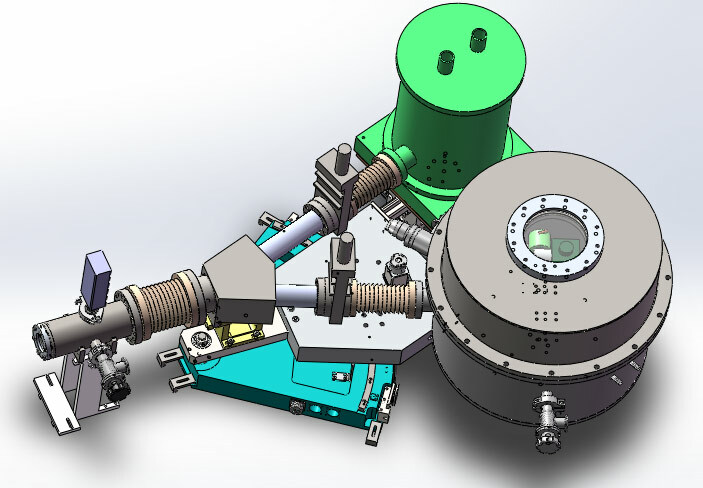 Through the comparison of the cryogenic radiometer and synchrotron radiation source, the validation of the two methods to each other would be accomplished, which loads the foundation for a new technology of high precision radiation standard and transfer detector in ultraviolet band.